This was an open trial for facial laxity. Female patients older than 18 years of age, non-pregnant, non-lactating were included after obtaining informed consent. Patients with implanted pacemakers or defibrillator were not included, since this is an absolute contraindication for RF therapy. Patients with presence of acute systemic infections and local infections such as herpes simplex or impetigo and those with open wounds in the area of treatment were excluded. Patients with genetic disorders of connective tissue, like cutis laxa, were excluded from this trial. We used the RF-ReFacing™ device based on the radioSURG™ equipment (Meyer-Haake Medical Innovations, Wehrheim/ Germany) in the monopolar mode. This equipment generated a frequency of 2.2 MHz. Monopolar systems deliver current through a single contact point with an accompanying grounding pad that serves as a low resistance path for current flow to complete the electrical circuit. Patients were treated in a lying position with the large neutral electrode placed beneath the shoulder. In most cases, a large ball electrode (diameter, 8 mm) was employed for facial treatment. In some cases, a cone-shaped electrode (diameter, 15 mm; cone height, 20 mm) was used. The skin was covered by a facial moisturizing cream, and the facial parts were treated by two passes per session with an interval of 2 weeks for a total of three sessions. The power was adjusted to the patient's comfort to get the sense of a light, convenient warming of tissue, e.g., 8-12 W. In this setting, no cooling of skin was necessary. Photos were taken before and after each session. Patients were asked about their satisfaction. A blinded score of the photos was performed by a doctor not involved in treatment. Scoring was carried out in a 3-step mode: 0 - no change; 1 - moderate improvement; 3 - marked improvement. A total of 20 female patients were included (age range, 34-73 years; mean age, 41±11 years). Four patients were smokers; none was attending a tanning saloon. All patients were Caucasians with photo-skin type I to III; the majority (n=13) had a skin type II. The procedure did not need any analgesia or anaesthetics. We did not see any adverse effect, such as burning, ecchymosis or pigmentary changes. Treatment took only 10 minutes per session. The procedure was scored as most convenient or convenient by all patients. There was no down-time for patients. 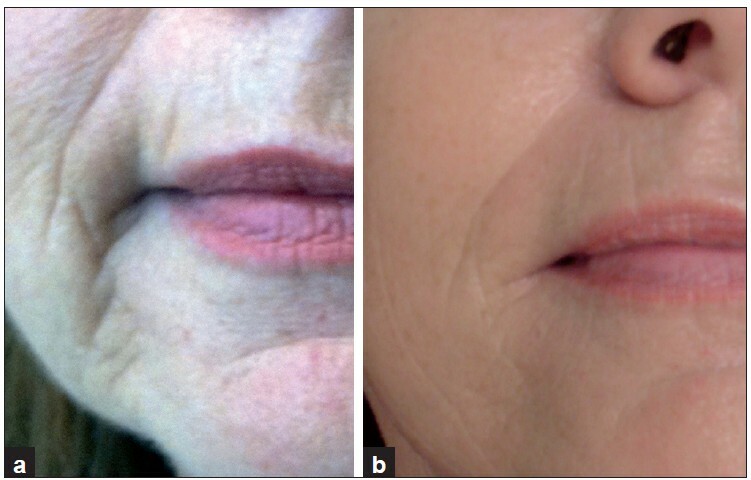 Improvement in skin laxity and fine wrinkles was seen after the second treatment in 19 of the 20 patients and after the third treatment in 100% of the patients. On a scale from 0 to 3 (worsening, no change, mild change, moderate-to-marked change, respectively), improvement in the lower lid, Crow's feet and jowl line was scored 2.6±0.7 (average score) by patients. Improvement in the overall appearance of the face was scored 2.3±0.5. The blinded assessment of the photographs rated the improvement as good or better in 15 of the 20 patients, moderate in 3 patients, no change in 1 patient. Results are shown in [Figure 1],[Figure 2],[Figure 3] for lower lids; and in [Figure 4], for tear-trough. Although the clinical effect is age dependent, improvement could be seen also in patients older than 60 years of age. The strongest effects were achieved for lower lids (improvement score, 2.8±0.6), followed by Crow's feet (2.7±0.6) and jowl line (2.4±0.7). The improvement in Crow`s feet and lower eye lids reached significance comparing the situation before and after the third treatment (P=0.04; one-sided Student's t-test) but not for the jowl line (P=0.056). 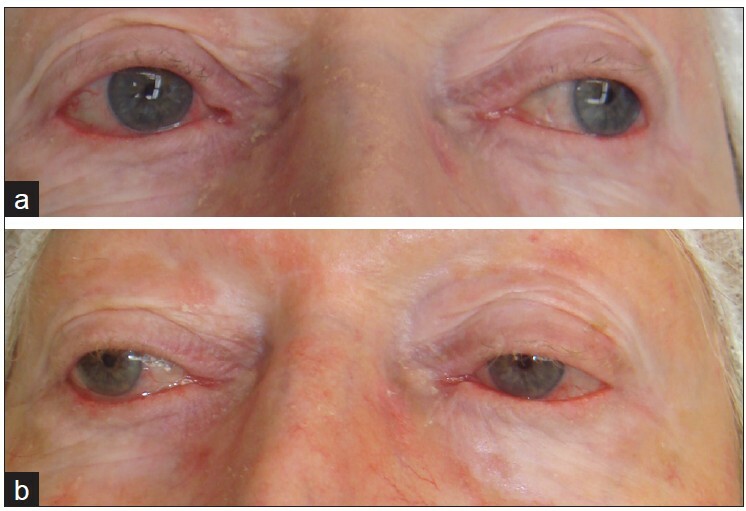 In addition to the periocular skin, we noted improvement in cheeks, lower face and neck in several patients as well [Figure 5] and[Figure 6]. Effects were obvious but not dramatic. Nevertheless, patients' satisfaction was high. The RF-ReFacing™ treatment may be used in combination with other procedures for better results but was used only as a monotherapy in this study. In a monopolar configuration, one electrode is active and the other (a considerably larger one) is placed far from the first one and serves as a grounding pad. The main advantage of monopolar delivery is the concentration of a high-power density on the surface of the electrode and the relatively deep penetration of the emitted power. In contrast to laser, monopolar RF offers volumetric heating. The depth of heating is dependent upon the size and geometry of the treatment tip being used. A conductive coupling fluid is used during the treatment to enhance the thermal and electrical contact between the treatment tip and the skin. Monopolar electrodes concentrate most of their energy near the point of contact, and energy rapidly diminishes as the current flows toward the grounding electrode. Using electrode configurations like large-ball or cone electrodes, and adjust the current penetration can be balanced according to the needs of facial skin. A facial moisturizing cream was used for conductive coupling. The present trial included Caucasian patients with Fitzpatrick skin types I-III. We observed a marked improvement in skin laxity and fine wrinkling, in particular on the lower eye lids and the Crow's feet. Adverse effects were not noted. The treatment is safe and convenient. It is not time consuming and may be performed as a lunch procedure. 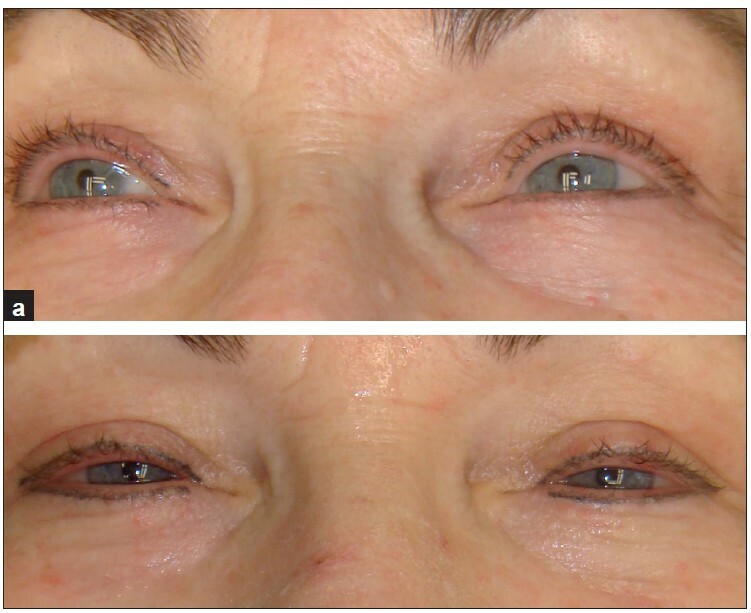 Our results are supported by a smaller study by Ruiz-Esparza on non-invasive lower eye lid blepharoplasty by non-ablative radiofrequency in 9 patients. In contrast to his procedure, in this trial no analgesia was used. An option for further improvement of outcome might be the multi-pass vector RF therapy as suggested by Finzi and Spangler. By this technique, more oedema was noted, but severe adverse effects were not seen. In this trial, we limited the application to two passes only. More passes might increase efficacy, but this has not been investigated in detail. Another major advantage of monopolar RF is its applicability to various age groups. Although the final outcome might be better in biologically younger facial skin, there is no age limit. Nevertheless, when a surgical intervention is necessary, RF is not a substitute. On the other hand, RF technique might prolong the time to the first surgical facial lift. This study has some limits - small number of patients, broad age range, no objective measurements of laxity. Therefore, multi-centre trials would be most useful to increase the number of patients and introduce more sophisticated measurements of the effect. Within these limits, the monopolar RF device seems to be a useful tool with low costs and high levels of patient satisfaction. 1. Wasserman D, Avram MA. Pathophysiology of skin laxity and cellulite. In: Katz BE, Sadick NS, Dover JS, Alam M, editors. Body Contouring. Procedures in Cosmetic Dermatology. USA: Saunders Elsevier; 2010. p. 25-30. 2. Goldman A, Shavelzon D, Blugerman G. Laser lipolysis: Liposuction using Nd:YAG laser. Rev Soc Brasil Chir Plast 2002;17:17-21. 3. Goldman A. Submental Nd:YAG laser-assisted liposuction. Lasers Surg Med 2006;38:181-4. 4. Arnoczkay SP, Aksan A. Thermal modification of connective tissues: Basic science considerations and clinical implications. J Am Acad Orthop Surg 2000;8:305-13. 5. Sadick NS, Makino Y. Selective electro-thermolysis in aesthetic medicine: A review. Lasers Surg Med 2004;34:91-7. 6. Zelickson BD, Kist D, Bernstein E, Brown DB, Ksenzenko S, Burns J, et al. Histological and ultrastructural evaluation of the effects of a radiofrequency-based nonablative dermal remodeling device: A pilot study. Arch Dermatol 2004;140:204-9. 7. Dierickx CC. The role of deep heating for noninvasive skin rejuvenation. Laser Surg Med 2006;38:799-807. 8. Homoth J, Wenderoth M, Druga T, Winking L, Ulbrich RG, Bobish CA, et al. Electronic transport on the nanoscale: Ballistic transmission and Ohm's law. Nano Lett 2009;4:1588-92. 9. Hsu TS, Kaminer MS. The use of nonablative radiofrequency technology to tighten the lower face and neck. Semin Cutan Med Surg 2003;22:115-23. 10. 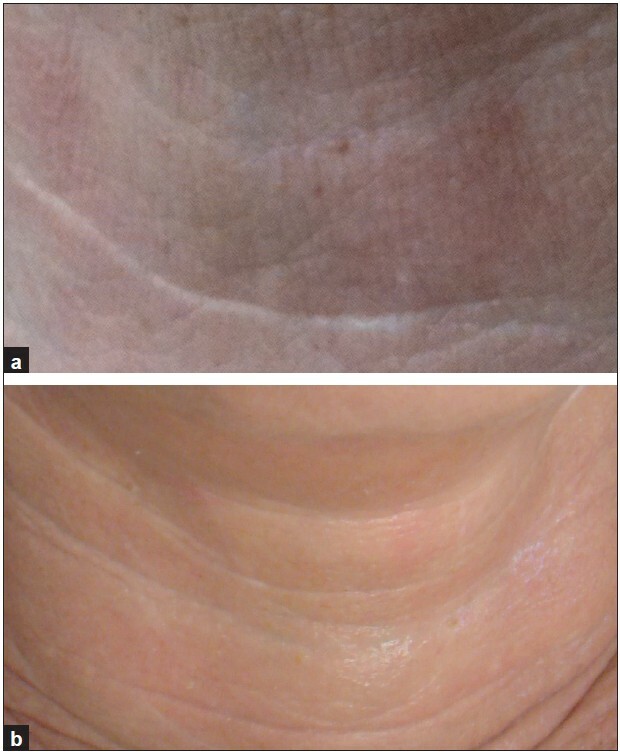 Fitzpatrick R, Geronemus R, Goldberg D, Kaminer M, Kilmer S, Ruiz-Esparza J. Multicenter study of noninvasive radiofrequency for periorbital tissue tightening. Lasers Surg Med 2003;33:232-42. 11. Alster TS, Tanzi E. Improvement of neck and cheek laxity with a nonablative radiofrequency device: A lifting experience. Dermatol Surg 2004;30:503-7. 12. Nahm WK, Su TT, Rotunda AM, Moy RL. 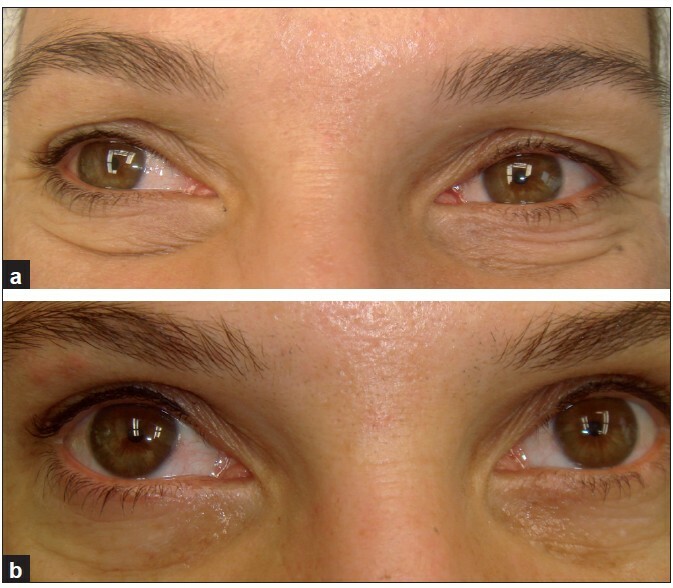 Objective changes in brow position, superior palpebral crease, peak angle of the eyebrow and jowl surface area after volumetric radiofrequency treatments to half of the face. Dermatol Surg 2004;30:922-8. 13. Fritz M, Counters JT, Zelickson BD. Radiofrequency treatment for middle and lower face laxity. Arch Facial Plast Surg 2004;6:370-3. 14. Koch RJ. Radiofrequency nonablative tissue tightening. Facial Plast Surg Clin North Am 2004;12:339-46,v. 15. Weiss RA, Weiss MA, Munavalli G, Beasley KL. Monopolar radiofrequency facial tightening: A retrospective analysis of efficacy and safety in over 600 treatments. J Drugs Dermatol 2006;5:707-12. 16. Alexiades-Armenakas M, Rosenberg D, Renton B, Dover J, Arndt L. Blinded, randomized, quantitative grading comparison of minimally invasive, fractional readiorequency and surgical face-lift to treat skin laxity. Arch Dermatol 2010;146:396-405. 18. 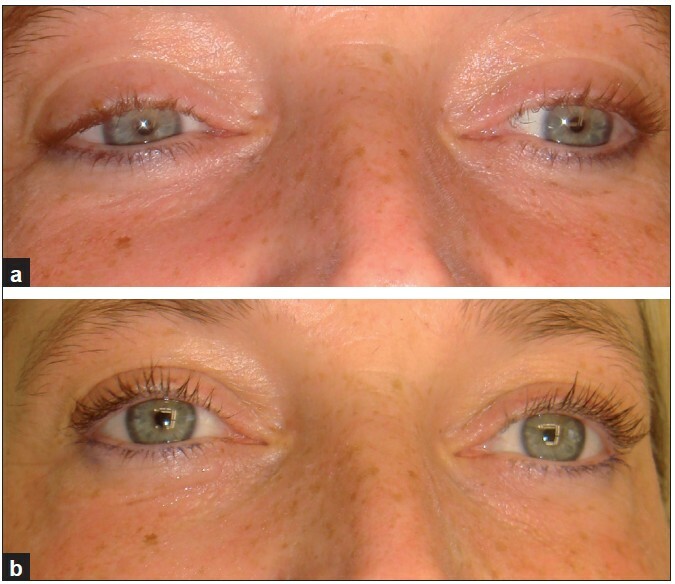 Ruiz-Esparza J. Noninvasive lower eyelid blepharoplasty: A new technique using nonablative radiofrequency on periorbital skin. Dermatol Surg 2004;30:125-9. 19. Finzi E, Spangler A. Multipass vector (mpave) technique with nonablative radiofrequency to treat facial and neck laxity. Dermatol Surg 2005;31:916-22.